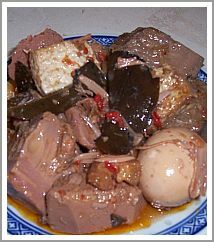 Gudeg is a traditional Indonesian recipe, originally comes from Yogyakarta, Central Java. This traditional recipe is the most famous dish of jackfruit curry in combination with some eggs and chicken. Very delicious despite how it looks. Don't bother about the looks, it's not as appetizing as it taste. Believe me, once you've taste the dish, you'll be sell forever. But these kinds of recipe are certainly not a low calorie recipe. The coconut milk takes care of the high calorie of this recipe. But if you eat this, you can feel that your stomach would be satisfied for certainly a couple of hour. That is certainly the benefit of coconut milk recipe. It fills your stomach and you don't have to grab something else to please your stomach. It's a great investment for your trouble, because it's not easy to make this recipe. You might find difficult to make the dish, but I can assure, its worth of try. The first time you cook this, you might be unsatisfied about the taste. Try a few times; I'm sure it will get better. I've been there, so I know it took a little bit effort to make the right taste of this recipe. 1. Put Garlic, Onion, Red Chilies and candlenuts in the food processor and blend it until you get the smooth paste. 2. Heat 2 tablespoon vegetable oil in the pan, add the mixture, dried shrimp paste (terasi), and coriander powder, stirring it often to make sure that you don’t get burn parts on the bottom. Fry it until the mixture brown, and fragrant. 3. Then add chicken filet that you have already washed and coconut milk. Let them boiled for a few minutes at low fire. 4. Add the jackfruit including the juice from the can, boiled eggs, tofu, Sugar, Salt, chicken bouillon powder. The taste has to be between sweet and salt. Cook at low fire for about 1 hour until the oil comes out. Served with warm rice and sambal.